On Christmas Day this year, there were 4,101 views on my YouTube channel, which also passed the 14,000,000 lifetime views mark on the same day. 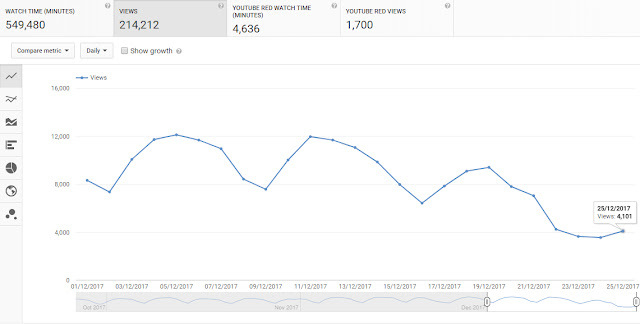 December also shows the traditional decline from a high of around 12,000 views per day to a around third of this amount over the Christmas holidays leading to the New Year. So, I wondered who was watching on Christmas day? YouTube Analytics tells me that India leads the way with 1,329 (32.4%) views, while the United States is a distant second with 320 (7.8%) views. In the top ten on Christmas Day are countries like Saudi Arabia (138), Turkey (117), Egypt (85), and the United Arab Emirates (55). None of these countries feature in the top ten list for the whole year so far. Countries like the UK, Canada, Australia, and Ireland basically switch off at Christmas. There were 39 views on my channel on Christmas Day - I wonder if any of these were my students? The most popular video worldwide on Christmas Day was How To... Perform Simple Linear Regression by Hand with 346 views. Even though there is a question on my exam paper next week on regression (that's not a hint, they already should know this! ), in Ireland there was just one view which lasted 4 minutes and 51 seconds - less than half the duration of this video. 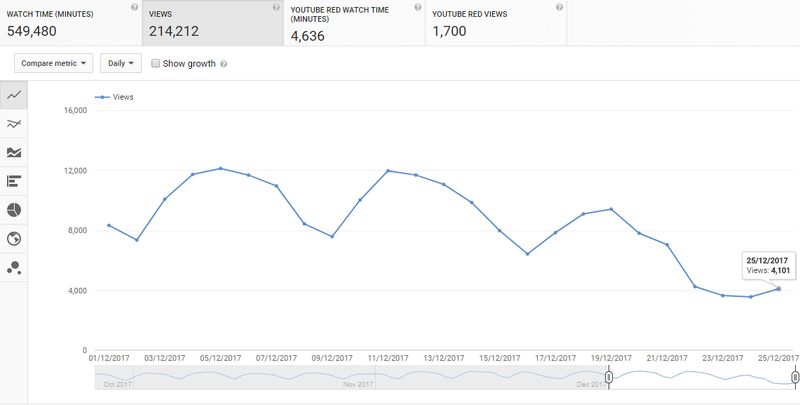 It's also interesting to note that YouTube/Google are now providing more visuals for content creators to analyse our data - these are visible on the left side panel on the chart above. More on this another day. Thank you to all my viewers over the holiday season. For those of you preparing for exams I hope that the videos will help in your revision.